Congratulations to our Flash winner Debora Kapke! Fresh air can be nice. But when it's ninety degrees and traffic is barely moving then air conditioning and cold water are hard to beat. Brenda and Fred had neither. The A/C in their Festiva had conked out 100 miles before, and the warm humid air it now spewed was reminiscent of a dog's hot breath, smell and all. 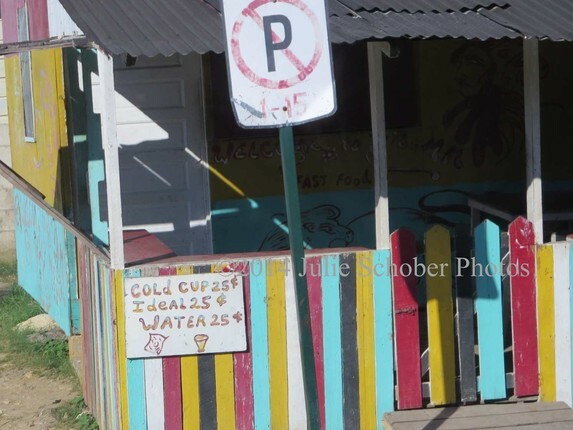 When they saw the sign for cold cups of water, they pulled out of the slow moving traffic without hesitation. The gravel sighed a plume of dry earth. The little shack advertising water could have been a rustic farmer's market, but its bright stripes made it seem displaced from a circus, fair, or perhaps a forgotten boardwalk. "Oh, thank God," sighed Brenda as she climbed out from the heat of the car. "You said it," said Fred. He fanned himself with a half-folded map. "Are they open, though? They kind of look closed." She pushed a piece of sweaty hair behind her equally sweaty ear. Even her necklace stuck awkwardly on the swampland that was her neck. There was a no-parking sign immediately outside the striped shack, so they'd parked several yards away. Fred walked closer to the odd little building as he examined the surroundings. There was another parked car, but he didn't see any people. Another shack leaned behind the first. Brenda walked to the sign advertising water and touched it as if to ensure it was no mirage. She stepped to the counter, knocking first, then shouting, "Hello?” Her shoulders fell when nobody answered. It looked so empty. "Nobody there? Son of a b-," started Fred. Miranda's hair was hot pink with green tips. Her halter top, tight purple. Her head barely cleared the counter so that her shoulders lifted an inch as she rested her arms there and asked, "Can I help you?" Brenda jumped a little and looked down. "Sorry, we didn't see you there." "I'm usually hard to miss." Brenda and Fred were a little confused as they weren’t sure if she meant the seats or their car. Miranda meant the water. When they cleared that bit of confusion, Brenda and Fred figured it had become pretty obvious they just wanted a cold cup of water like the sign read. They said so. Fred wanted things to be simple, and this seemed way overly complicated for a cold cup of water. “Just a perfect cold cup of water, so seventy-five cents, right?” He fumbled with his wallet for a credit card. Brenda was rather intrigued with the trade option seeing as they, in fact, had no cash. Fred thought it all sounded ridiculous and stood indignant, as if that would somehow motivate Mirada to bring forth the water. Brenda looked at them both and galumphed to the Festiva parked near the shoulder of the road. She searched seats. Console. Glove compartment. She found a dime and some pennies. Then a nickle. Pocketing that, she searched the gravel on the shoulder of the road. There was a crushed earring. A dirty, used paper cup. And voila, a quarter! Enough for water. What that meant for the rest she didn’t know. Bringing her bounty to the counter, she held it out proudly. Fred stared at the wall. Brenda search a bit more and returned with three extra pennies. It was the best water ever. Fred dashed out, a little embarrassed to have to do so. He returned with a plastic comb, the crushed earring, and fifty-three cents. Miranda handed him the cup and watched him drink. Brenda and Fred really didn’t see how that would help. Surely one cup of cold water would do nothing to combat the lack of air conditioning. One cup for the road, however, might not be a bad idea. Miranda spoke directly to Brenda, “Your necklace, and you’ll get the whole shebang. Cold cup, ideal, water. I don’t think you’ll be disappointed.” Her eyes gleamed. The cool scent of water lingered on Brenda’s lips. It was just too good to pass up. She slid off the necklace and handed it over. Miranda suggested she share with the car instead of Fred. Brenda nodded. She was pretty sure she knew the reason. She sipped the cup carefully so as not to spill on her way. She felt better with each step. Popping the hood, she poured a little in the coolant reservoir and then the windshield fluid, setting what remained in the cup holder in the middle. When the frost formed on the window, Fred jumped in and they drove on. Deb Kapke writes speculative fiction and blogs on a variety of topics including writing and juggling a busy schedule. She lives near the nation's capital in a temporarily windowless home with her super guy, amazing daughter, and two hungry cats. This story is so refreshing on a hot day. I actually could feel the heat in the story. Well done. Great story. I laughed out loud at Fred having to finish his profanity in another paragraph. Loved the humor here expressed through great characters. Well done. Thank you, Scott! Glad to see you here. You made me laugh out loud retelling the squaw pouring water on the necklace. It's pretty logical when you think about it, but probably not what you were expecting.